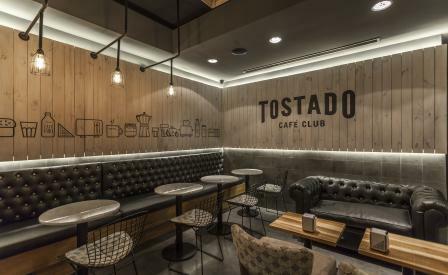 Tostado Café Club is the latest addition to a growing number of Buenos Aires restaurants keen to redefine traditional lunchtime fare such as pasta, steak and empanadas, with revamped takes on the classic Argentine tostado. Interiors, by architects Hitzig Militello and industry consultants The Brand Bean, have been created for both time-poor work types as well as passersby looking for a spot to take a breather. Downstairs, soft lighting, slate grey tiles and whitewashed wood panelling initiates a cosy atmosphere further enhanced by custom made chesterfield and cushioned armchairs by local furniture outfit, Casa Fad. Meanwhile, upstairs, a window counter with reproduction Bertoia wire bar stools is the perfect position for solo diners to people watch, while munching on grilled vegetable, cheese and Parma ham toasted sandwiches.